FREE-DAPTIVE Divers was founded with one goal - to give people who, because of a disability, thought they may never be able to go scuba diving. We come from a variety of disciplines and personal histories, but we all are trained as scuba professionals utilizing HSA dive protocols. FREE-DAPTIVE DIVERS, a non-profit 501 (c) (3) was organized in 2016 to provide Scuba diving experiences to the adaptive needs community. For adaptive divers, water is “The Great Equalizer”, offering those with a disability a weightless environment; creating independence, freedom of movement, comfort, as well as a sense of accomplishment which may not be replicated on land. 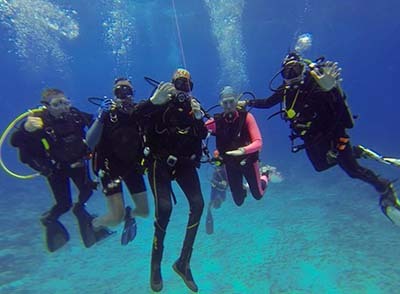 Additionally, thanks to the “buddy” nature of scuba diving, social bonds enhance the “equalizing” effect. You’ll hear from FREE-DAPTIVE co-Founders Rick Kline and Tom Cornell about the genesis of the organization, their mission, achievements and the future of adaptive scuba diving. Then, adaptive divers Becky and Chad Walker will share their experiences on the challenges and excitement that adaptive divers experience.